With us all having recording studios in our pockets and everything we capture put on YouTube within minutes, the notion of an Alan Lomax or Arhoolie Records’ Chris Strachwitz intrepidly making field recordings to preserve cultural music expressions, seems anachronistic if not obsolete. 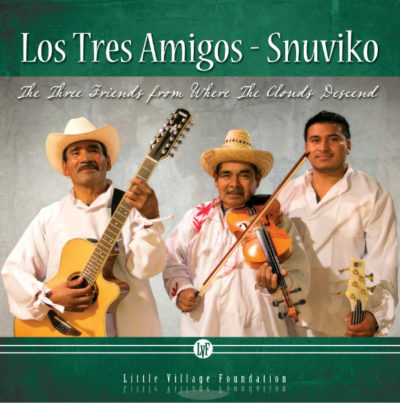 “The Three Friends from Where the Clouds Descend” by the trio Los Tres Amigos – Snuviko puts the lie to that. One of four inaugural releases from the Little Village Foundation, the venture of musician and insatiable seeker Jim Pugh, the album captures lively instrumental music originating in the Oaxacan mountain village of Snuviko, which in the local Mixtec language means “where the clouds descend.” Pugh found this music, though, in a vibrant Mixtec community that has come together among the farmworkers around Santa Maria in Central California. Pugh, a Chicago native now living in the Santa Ynez Valley, was tipped off to these guys by members of a Norteño band he met in Lompoc, who alerted him that they spoke neither English nor Spanish. But with a Mixtec translator, he found them — guitarist Juan Hernandez, violinist Alberto López and bassist Jacobo Martinez — and recorded them in a Buellton studio. The music is raw, expressive, evocative of both life in Mexico and Central California. It’s a valuable document, sure. But more important, it’s a great listen — just like the best Lomax and Strachwitz recordings. The Little Village slogan is “Pebbles on the Beach, Sounds from the Margins.” The other initial releases are from cowboy balladeer Dave Ellis, soul man Wee Willie Walker and boogie blues guitarist Ron Thompson, just the first round of Pugh’s marginal beachcombing.